"We are not disabled, we are differently abled," is the motto of many that society wrongly defines as disabled. In a black box theatre and intimate setting, a group of nine talented actors replayed a simple story they put together inspired from a two-month workshop in which they discussed the issues that differently abled people have in Egypt. Around 10 per cent of the Egyptian population (some eight million people) have a disability, whether physical or mental, and often face cultural, social and even political marginalisation. The group of actors was made up of some who have a hearing disability, and others with a physical disability, along with a group without disabilities. The workshop was conducted under the umbrella of Noon Creative Enterprises' "You Can" programme that aims to use art to empower people of different abilities and raise awareness on the issue. "If art is utilised it can raise awareness and change perceptions," Nairy Avedissian, programme coordinator of You Can told Ahram Online. 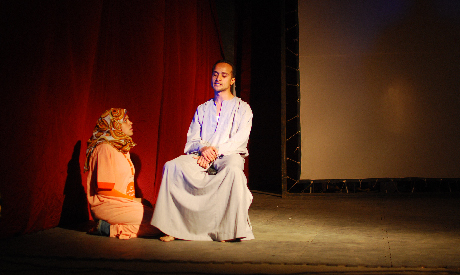 The play discussed the right to education for differently abled people, which at the moment in Egypt is a "disgrace" according to the group. "They only get basic education that is not up to standards, so they can't get jobs," Avedissian said. "This is not a pity show, it's a story of real life challenges overcome through the performance," Nada Sabet, director of the play said. "People formed personal relationships and facilitated understanding," Sabet said, explaining their workshop experience. "Sometimes you'd find someone blind and someone with a hearing disability communicating through a participant who had both abilities." "We all have different abilities and disabilities," she reflected. The entire play had a sign language translator on the side, Fayrouz Mohamed El-Sayed, who also had a role in the play. The play starts in the home of Warda (played by Basma Mohamed El-Sayed, who has a hearing disability), a young girl with impaired hearing. She rattles around the house while her sister tries to convince her father to send her to school. Her father is reluctant because he thinks she cannot fit in, but eventually agrees to send her to a school nearby for children with hearing disabilities. "Some parents hide their children with disabilities," the father of an actor in the play, Mohamed Sobhy, told the audience during a Q&A. "We build a lack of confidence in the child because of our own lack of tolerance. If we teach ourselves how to communicate with them, trust and inclusion in society will follow," he asserted. He went on to tell the story of his son's success and how many friends from all over the world he has. The speech moved the audience to tears. "They are not extras to the society, they are from the heart of the community," he said. From there, the play shows us Warda's story, along with her friends, as they go to school, attend class, play around with the teacher, just as children do. Ahmed Samy, who studies computer science and is a member of the Egyptian Institution for the Rights of the Hearing Disabled, plays Warda's love interest and schoolmate, Moody. Moody tries to get on the school football team, but he cannot, as he can't hear the whisle. His trainer is completely intolerant of his condition, in spite of his father's attempts to include him, and his teammates made fun of him and say lies about him to his face, which he cannot hear. In another situation, as the group graduate from school and start working, their employers shout at them, treat them badly, and take advantage of the fact that they cannot hear. They also make anouncements regarding the factory on a speaker, and have no sign language translators or any tools to aid the hearing impaired. This scene reflects the issues differently abled people face in the workplace. Another issue is that in spite of many laws in place to ensure inclusion of differently abled people in the workplace, many companies simply add them to the payroll and avoid having them come in to do any work. As Warda and Moody are getting married, their real estate agent sells them an apartment different to their agreement. They only managed to get the house of their dreams when both their fathers intervened. According to one of the parents of differently abled people in the audience, these situations happen often. People in society tend to take advantage of them, instead of protecting them. The challenges people with disabilities face are not only socially and through the workplace and educational system. They also have political challenges. According to parents of the actors, people with different abilities had a role in the Egyptian revolution and were taking part in protests in Tahrir Square and other governorates. After Mubarak's ousting, a group of them presented a list of demands on behalf of people with different abilities to the Supreme Council of the Armed Forces. "The simplest thing is that there is no version of the constitution that is accessible to people who cannot see," Nevine El-Attar, a member of the Network Supporting the Political Rights of the Differently Abled said. The Network includes several relevant civil society organisations. They have been working since the revolution to make sure elections and other channels of political participation are accessible for differently abled people after the revolution. "In spite of our efforts, we had 250 recorded cases of people who couldn't vote because of the polling station being on a high-up floor or having no accessibility for the blind, and so on," El-Attar told Ahram Online. The network is working as a lobby and pressure group to ensure that the UN Convention on the Rights of Persons with Disabilities, which Egypt signed, is adhered to and reflected in Egyptian law. "The current laws are full of loopholes and don't protect [the differently abled]," El-Attar states. The group calls for the establishment of a "National High Council for Disabilities" that would be independent of the government and adhere to the head of state, run entirely by differently abled people and their supporters. "Our government does not have any awareness about our issues," a member of audience with a physical disability said. "We need a body to represent us and ensure our inclusion in society." A parent of two who have hearing disabilities but that managed to graduate from university, Soheir Abdel-Aziz, was very happy with the performance and its reflection on real life stories. "This was the first time I saw real people tell their stories and not actors looking down upon us," Abdel-Aziz — who has a PhD in the rehabilitation of differently abled people — said. "I took a decision today to learn sign language," a member of the audience stood up and stated during the Q&A session with the actors. The audience applauded, their eyes full of tears of inspiration. From this successful first trial, it is clear that theatre is a tool that can not only raise awareness about the challenges differently abled people face, but also empower them to demand their rights within society. The play is scheduled to run Wednesday and Thursday 28-29 March at 7.30pm in Nahda Center for Arts and Sciences, 15 Mahrany Street, El-Fagala Ramsis (behind the Jesuit School).